After Rudyard Kipling’s If, Imagine, Human Rights Day and World Storytelling Day, here is the new video from Storytellers for Peace. 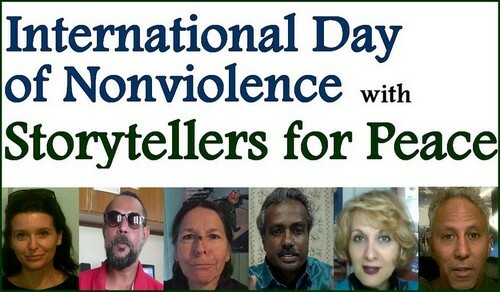 How storytelling could spread and support non-violence? Storytellers for Peace, artists from different countries, tell their stories in their first language (with English subtitles). Scheherazade is the new sultan's bride. Like all the others, Scheherazade will die at dawn. To allow the sultan to marry again. But Scheherazade is smart and above all has a sister. That wedding night, before going to sleep, she asks Scheherazade to tell her a story. Scheherazade gets the sultan's permission and begins to tell. At dawn the story is not over and the sultan decides not to kill Scheherazade because he wants to know the ending. So, for another night and many others Scheherazade tells. And when the story finally ends, the Sultan no longer has the will to kill her because he has fallen in love with her in the meantime, and her ability to tell stories. Probably the most interesting saying about non-violence was coined by a Chinese philosopher. He said it’s only when a mosquito lands on your testicles then you realize there is always a way to solve problems without using violence. If everybody understand this sayings, he or she have to laugh as a Buddha. Mahatma Gandhi said that non-violence is a weapon of the strong ones. The evidence came by Martin Luther King, who said that at the center of non-violence stands the principle of love. So, let’s love all creatures. Because the heart of human beings is greater than universe. So if we want, we can mutually live without harm anybody. Say no to Violence. Let’s talk and walk on the way of love. Let’s make the planet peaceful. Hello dear enemy - No Violence against anything or anyone. Corruption, terror, flogging, oppression, violence, I don't want. Love, kindness, mercy, non-violence, co-existence, peace, I like very much. There is a fable of Gandhi that I like and I will share here. It says that when Mahatma Gandhi lived in London, while studying at an English university, there was a professor, named Peters, who contradicted Gandhi. Every time he met him When they were among the hallways, in the university dining room and in the classroom. On one occasion when Gandhi went to lunch, he met his teacher in the dining room. - Student Gandhi, you still don’t understand. - Don’t you know that a pig cannot sit next to a bird? - Oh, sorry teacher, excuse me. I'm flying away right now! - Student Gandhi, if you were walking down the street and came across two bags, one of wisdom and another with money, which one would you choose? - Of course I will choose the money! - Ah! If I had been you, I would have chosen the bag wisely. -Well, teacher, everyone picks up what they do not have. The professor was much angrier than before. The teacher takes the pages of Gandhi's exam and writes at the end: IDIOT. Then he gives the paper to his student. Gandhi watches his entire examination. There was no correction. There was no rating or note. Nothing, except the word: IDIOT. Only with a story you can show the horrors of the world with absolute precision and honesty, as if they were exactly before your eyes, and thus prevent them. Only with a story you can give a face, at the right time, to the murderers and the victims, so that there is no way to confuse them. Only with a story you can show how peace and its gifts are possible. Because what enters a story, from it and with it, can arrive anywhere. Storytellers for Peace is an international network of narrators who create collective stories through videos. Artists and stories are from all over the world and speak about peace, justice, equality and human rights. All participants tell one or more verses of the story in their first language. The project was created and is coordinated by Alessandro Ghebreigziabiher, author, storyteller, stage actor and director. Let's make peace through stories!